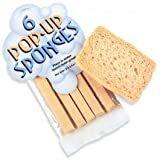 Normally, I don't too excited about sponges, but check out these cool new Pop-Up Sponges. 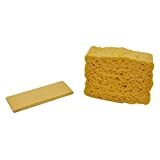 Every single bit of kitchen space is valuable including the space wasted by regular scrubbing sponges stored under the sink, but these flat, compressed, and all-natural cellulose sponges expand to full-size when immersed in water. They're highly absorbent and gentle on cookware and tableware and up to six of these unique space-saving sponges fill up the same space as a single normal one. To extend their life, just toss them in the dishwasher to extend their life and keep them clean and fresh. Sold in a set of six large sponges or twelve regular sponges in a variety of colors.